Matar Kulcha is one of the most famous street food from Delhi. A classic vegetarian snack consisting of dried white peas cooked with spices and served with a white flatbread called kulcha. The combination of matar kulcha is a must try Delhi street food. 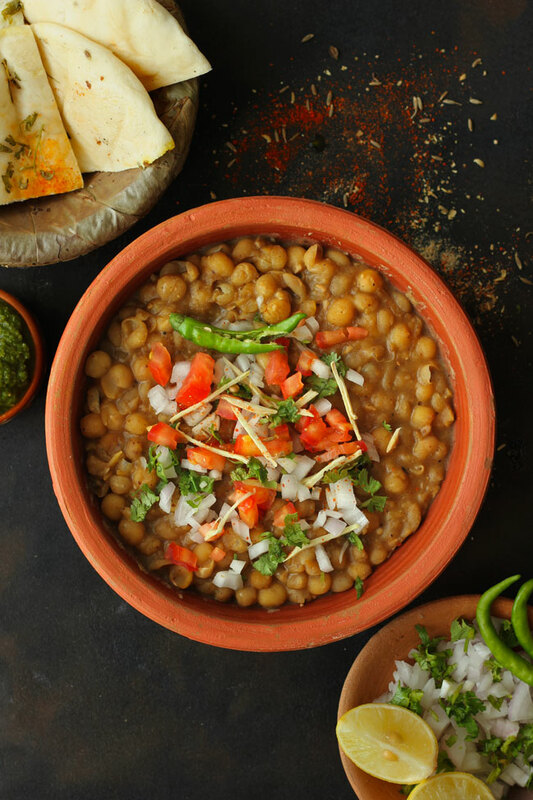 A flavorsome green chutney, pickled vegetables, grated radish, and mirch ki tapori served alongside the plate of chole kulche gives the purest outburst of flavors in each bite. Safed matar or vatana is known as dried white peas. 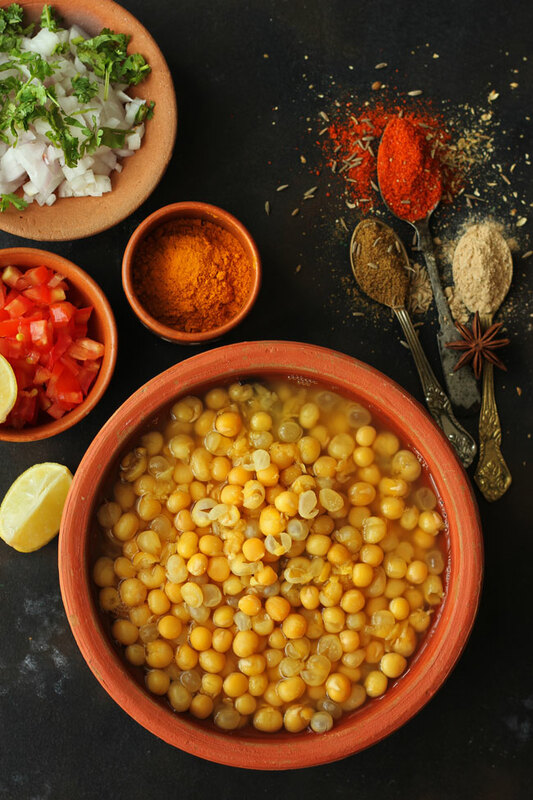 They are often used to make popular Mumbai street food ragda pattice. The white peas look very similar to chickpeas (chana) but are smaller in size and perfectly round. White peas are nothing but the dried version of the fresh green peas. In earlier days, dried white peas were used in the season when fresh green peas are scare or not available. Nowadays, white peas are mainly used to prepare curries. 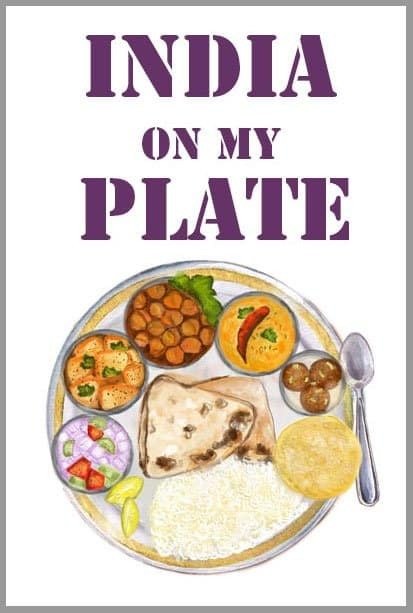 To those living in and around Delhi, this dish isn’t unfamiliar. It is a simple vegetarian delicacy from the by-lanes of Delhi and widely popular among the neighboring states. 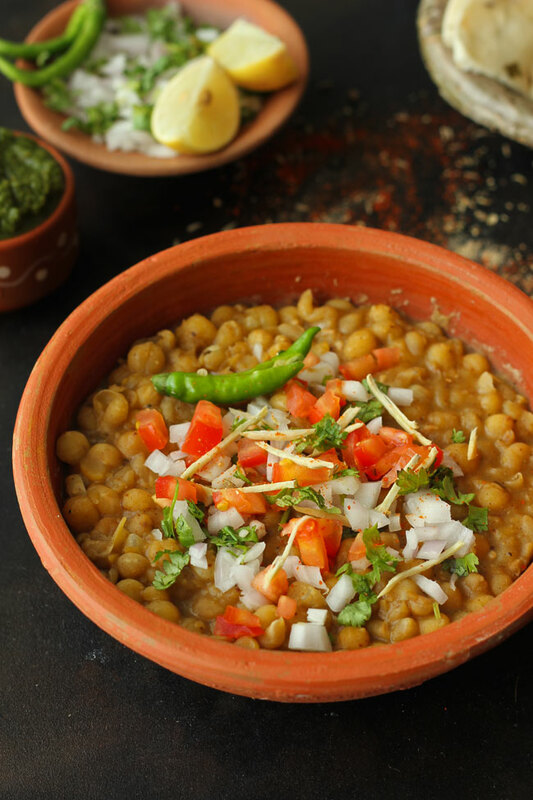 The dried white peas are cooked with few basic spices and generously garnished with chopped onion, tomato, ginger, and green chili just before serving. And it is always served with the bakery made light and fluffy bread called kulcha. Matar with kulcha has a mélange of essences in every bite. Matar tastes best when eaten hot, with a nicely buttered kulcha. You can eat this white pea curry with paratha, chapati also but the kulcha is preferred for its soft, almost pillow-like consistency and delicate texture. Some food combinations are like the match made in heaven. Such as – chana and bhatura, pav and bhaji, aloo ki sabzi and poori. Similarly, the matar taste best with the kulcha. You guys, I’m not kidding when I say Delhi has one of the best street foods in the world. 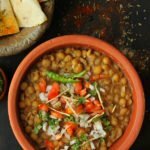 What characterizes the uniqueness of Delhi street food is the bold flavors, the freshness of ingredients, the finger-licking good side-dishes, and the easy accessibility. Almost every nook and corner of the capital has its legacy of street food items. The list is practically endless. But surely matar kulcha is one of our favorite street food from Delhi. It doesn’t take much to transform the goodness of these simple dried white peas into a delicious snack or a fulfilling breakfast. The best part of matar kulcha is that it is one dish that can be healthy and tasty too. While the kulcha provides a decent amount of carbs, the white pea is a great source of vegetarian protein. Also, we are not using any fat/oil in this matar kulcha recipe. Hence, making it a delicious yet wholesome street food recipe. Matar Kulcha is one of the most popular street food from Delhi. 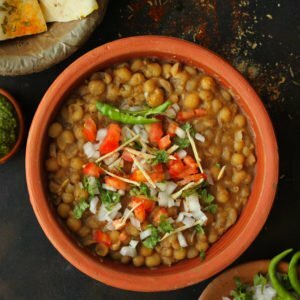 Learn how to make street style chole kulche in a few simple steps. Clean, wash and soak matar overnight in water or for 4 - 5 hours. Next day drain water, transfer matar in a pressure cooker with approximately 6 Cups of water and salt. Pressure cook the peas till soft but not mushy. It usually takes 2 - 3 whistles over a low flame. Allow the steam to release naturally from the pressure cooker. Open the lid, check for doneness and set aside. In a heavy bottom pan (kadhai) add the dry spices - garam masala, chaat masala, asafoetida, and black pepper powder. Dry roast for 1 - 2 seconds or till the aroma of spices is released. Now add the boiled matar without any liquid. Stir to combine nicely. Taste and add the salt accordingly. Next, add tamarind pulp, sliced green chilli, ginger and a ladle full of reserved liquid from boiled peas. Mix nicely and allow matar to simmer over low heat for 10 - 15 minutes to absorb the flavor of spices. If the matar seems too dry add more reserved liquid from the boiled peas. Transfer prepared matar to a serving bowl. Garnish with chopped onion, tomato, and coriander leaves. 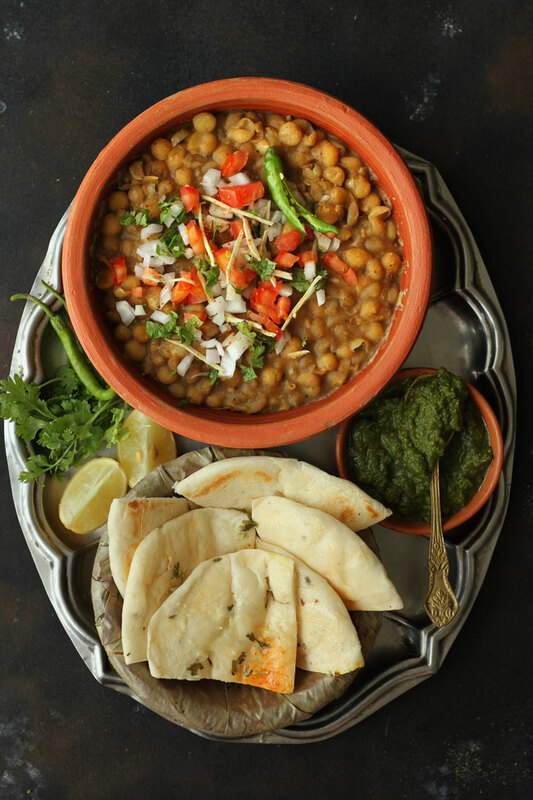 Serve Delhi Style Matar with kulcha and coriander chutney. The leftover liquid in the pressure cooker after boiling peas is used to get the desired consistency of the matar curry. So it is best to reserve it till the matar are fully done.